One of my favourite things is standing at my bookshelves selecting my next book to read. I can happily stare at my books for far longer than seems reasonable, waiting for a whim to make me choose one over all of the others. But most people don’t have more than 100 unread books sat around in their house, so how do you choose your next book? I also get great pleasure from going to a bookshop without any titles in mind and just browsing until something jumps out at me. Much like my method of choosing from my own library! I am trying to reduce the TBR at the moment and have therefore not yet been to Bristol’s brand new Foyles bookshop, or indeed the almost-as-new The Last Bookshop on Park Street, but later this year I plan to do a bit of a tour of Bristol’s bookshops. Watch this space! Back in my early twenties I read The Unbearable Lightness of Being and other books by Milan Kundera and loved them. But a few years later, when I read more of his books, I struggled – I found them dull, monotonous, samey. The same happened with other authors I’d loved during and just after my degree course: Chuck Palahniuk and Orhan Pamuk spring to mind. (Okay, no-one could call Palahniuk dull but I haven’t really enjoyed any of his books since Diary.) I had decided that I loved these authors only to change my mind shortly afterward. Did I just read all the good ones first and save the crud for later or did I grow out of these particular authors? This has happened before of course. The first series I can remember falling in love with was Colin Dann’s Animals of Farthing Wood, shortly followed by Brian Jacques’ Redwall. I continued to buy those books as they came out well into my teens but the last few were left unread, as my interest had petered out. In my teens I loved the works of Victoria Holt/Phillippa Carr and anything in the Point Horror series but (thankfully) I grew out of those as well. And I expected that. 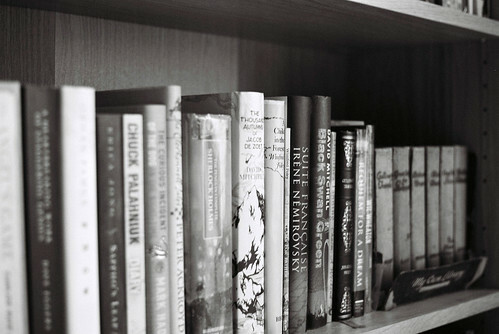 To grow out of those books was part of growing up. But I never expected to grow out of adult books, for there to be authors who only appealed to me for a few years of my adult life. It seems bizarre. But then maybe I’m wrong. Maybe it’s more that my taste in books is in flux and I have to wait a few years for the vibe of my early 20s to hit again. Maybe when I hit 40 or 50 I’ll pick up a Kundera or Pamuk and love it. In fact, maybe when I hit middle age I can stop buying new books altogether and re-read all the ones that I have kept because I enjoyed them the first time around. As I’m something of a book hoarder, I hope so. 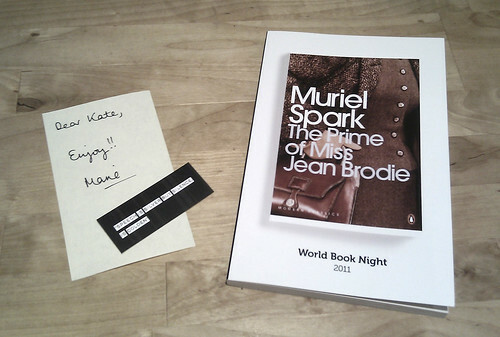 My book arrived from Marie of Little Interpret as part of her World Book Day giveaway. Thanks Marie! I look forward to reading it and passing it on. Inspired by Wallace of Unputdownables‘ lovely post about how her mum was her biggest reading influence, I got thinking about people who were important to me in that respect. One of my big reading influences was my third-year infants teacher, Mrs Barkley. She quickly cottoned on to the fact that I was not only way ahead in reading the official school reading scheme books, but I was bored and unchallenged by them. So she introduced me to her special book cupboard. That place was amazing! A lifetime’s worth of children’s books, mostly suitable for kids in exactly my situation. That’s where I discovered Mrs Pepperpot and Supergran and countless others. She retired at the end of that year and we held a special assembly for her, with lots of ragtime classics, including “Any old iron”, “She’s a lassie from Lancashire” and the specially written masterpiece “Knees up Mrs Barkley” (to the tune of “Knees up Mrs Brown”, if you didn’t get that). I remember that for “Here am I waiting at the church” we dressed up in bridesmaid dresses (or the closest equivalent we had) and I discovered to my horror on returning to the classroom to change for the next number that I’d gone out on stage with my ordinary dress unzipped and hanging around my waist, underneath the frilly frock. I was lifted by the success of playing Jennifer Eccles in “Lily the Pink”, particularly because I was deemed not freckly enough and had huge freckles drawn on my face. (At the age of seven I was a little self-conscious of my freckles.) But the highlight was when we sang Mrs Barkley’s favourite song “When you’re smiling” and she cried. It may have been the first time I saw someone cry with happiness. My parents also, of course, had their part in my love of reading. I am fairly certain I could read before I started school, which must have been down to them, mostly my Mum, but I also fondly remember Dad reading us to sleep (for some reason the only title I remember specifically being read to us is Danny the Champion of the World). They also read for themselves, though not voraciously, and there were always lots of books in our house. In later years I took to reading to my older sister when we went to bed, because I wanted to share my favourite books with her. I have no idea if she actually liked this or was just indulging her little sister. In fact, my whole family reads. But there is a definite step change between them and me. I was always the bookish one, even if everyone had a book on the go. I would read while walking to school, while eating my meals, with a torch under the bedcovers after lights out. I would read the same book a dozen times and make a diagram of the characters’ relationships or a timeline of events. And for some reason I attribute this extra level of obsessiveness, this need to devour every book in sight, to my favourite primary school teacher. So thank you Mrs Barkley! It’s now roughly 48 hours since I turned off the TV and started reading on Friday evening. I’ve got a lot of reading done – two full books, the last quarter of one and the first half of another – and I’ve been thoroughly reminded of the pleasure of putting reading before everything else, of spending hours on end absorbed in the pages of a book, so thank you to Wallace of Unputdownables for the challenge. I haven’t read entirely solidly, of course. Besides a couple of long nights’ sleep, I also did some housework, ran some errands, met friends for lunch. And I’m not stopping right now either, though I do have evening plans that will prevent me getting much more reading done this weekend. In total, I finished off Neil Gaiman’s The Graveyard Book, read Saturday by Ian McEwan (on the back of a recommendation from Kath of [Insert suitably snappy title here…]), read Slaughterhouse 5 by Kurt Vonnegut (as recommended by Gusset and several others on Twitter) and made a good start on reading Half of a Yellow Sun by Chimamanda Ngozi Adichie (recommended by Amy of Amy Reads). All the books I’ve read this weekend were really good, excellent even, and full reviews will follow when I get a chance to write them out! I hope all my fellow read-a-thoners have enjoyed/are still enjoying their weekend reads. So, an update on my progress so far in the 48-hour TBR read-a-thon. Yesterday I started well, finishing off Neil Gaiman’s The Graveyard Book (which I was already three-quarters through) before reading Saturday by Ian McEwan, on the back of a recommendation from Kath of [Insert suitably snappy title here…]. That turned out to be an excellent choice, keeping me so absorbed that I was awake until 1 a.m. when I finished it. Today I decided to tackle Slaughterhouse 5 by Kurt Vonnegut, which I’ve been eager to read for a while but then I mentioned this to a friend on Thursday who said she thought it was horribly hard-going, so that put me off. Some encouragement via Twitter put me back on track and I am definitely liking it so far. I’m only halfway through, partly because it’s not a quick read despite its short length, but also because I wasn’t able to entirely ignore the rest of the world today. The Graveyard Book is an evocative, imaginative adventure with intriguing characters and, in true Gaiman style, doesn’t shy away from tough subject matter. However, I just wasn’t absorbed by it and kept putting it aside to read other things instead. Saturday, on the other hand, was all-consuming and brought together politics, self-discovery, brilliant characterisation and outstanding writing. My only complaint would be that the main character is so irritatingly, snobbishly upper middle class; but that’s part of the point of course. And now I’ll get back to the reading. I hope all my fellow read-a-thoners are enjoying their weekend reads! Wallace of Unputdownables has challenged her readers to join her for a 48-hour TBR read-a-thon this weekend. Because clearly I have nothing else I should be getting on with (like decorating or building bookcases) I have decided to join in. Anyway, the point of this particular challenge is to make a dent in the TBR, which in my case is more than 130 books. That’s a lorra lot. We’re supposed to pick out a few that we intend to read, but I’m a bit lost as to where to start so I thought I’d ask for recommendations. My TBR is here. Please do take a look then come back and tell me what you both recommend and think I stand a chance of getting through in a weekend. I was thinking of queueing up Half of a Yellow Sun, Slaughterhouse 5 and the Southland Tales books. Any advances on that? Man Booker winner: must-read item? I’m a fan of the Booker Prize. It tends toward my personal taste and I have read and enjoyed many past winners, not to mention runners up. With my TBR pile teetering as high as it is I’m unlikely to rush out and buy this year’s winner, The Finkler Question by Howard Jacobsen, but I will probably read it eventually. All of which has got me thinking about book-buying habits. Would you buy a book just because it won a particular prize – e.g. the Orange Prize or the Hugo Award? Do you tend to buy books on a whim, maybe based on a combination of title, cover and synopsis? Do you only ever follow recommendations or stick to known authors? Do you possibly even read book reviews with the actual purpose of finding out about books you might like? Personally I do all of the above, hence my TBR. None of them is guaranteed to lead to a great reading experience. My favourite books have come from all sorts of sources but I have also had recommendations, prizewinners and promising bookshop finds turn out to be a bit rubbish. Or at least, not to my taste. When you’re a bibliophile, lending books can be problematic. They may come back damaged or dirty or not come back at all. The borrower may declare that they hate the book that you only loaned because you thought they’d love it. Many people choose not to ever lend books, instead only giving them away or keeping them. I’m not precious about the state of my books – if it makes it easier to read it I will break the spine and I often carry them around in my handbag (but don’t worry – I remind myself to be careful with other people’s). So a little bit of damage to a book of mine that I’ve loaned out isn’t going to bother me. But something that seems to bother other booklovers that I really don’t mind is when others don’t like the books I have loaned them, or vice versa. I don’t expect to like all the same books as my friends. There are so many books out there that it would be odd if we did. And I’m a critical reader; I rarely rave unreservedly about a book. I enjoy discussing books with people but if that conversation just went “I loved it!” “Me too!” wouldn’t that be dull? What about you? Do you have any strong feelings about lending books?